-burgh (Hinesburgh) and it seems likely that they all left Connecticut at the same time. Daniel and Ollie had two children at that time, Rodney and Lucena, and Daniel died seven years later, in June, 1800, leaving Ollie with five children all under ten years old. Apparently the only help she had was a boy under sixteen who is listed as a member of her family in the census of 1800. Ollie’s children married into the Hurlburt and McEwen families and more than twenty years after Daniel's death, Ollie herself married Robert McEwen to whose daughter, Miriam, her son Gaylord was already married. The Sherman-McEwen-Hurlburt clan all moved to northeastern New York - to Buck’s Bridge, Potsdam, Madrid, Canton and Morley. Some of their descendants migrated west and others are still living where their forebears settled long ago. Two brothers of Daniel, Ezra and Jotham, and one sister, Sarah, lived and died in New Milford. Ezra and his wife, Dinah Fair child, and Sarah, all died before I can remember but I knew well great uncle Jotham who was born in 1768 and died in 1859. He married Hannah Hatch and they had two sons. Homer and Daniel. Sometime between 1800 and 1807 my grandfather, Eli Sherman, moved to Fairfield, Vermont. He had married in November, 1788, Polly Phelps of North Fairfield, Connecticut. A number of families from Fairfield and Worth Fairfield moved to Vermont, settled in the same neighborhood, and decided to give their new home the same name as the town they had left. 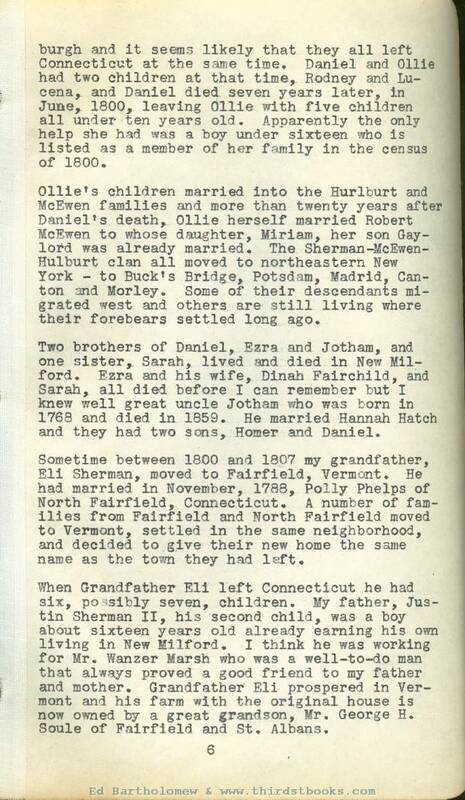 When Grandfather Eli left Connecticut he had six, possibly seven, children. My father. Justin Sherman II, his second child, was a boy about sixteen years old already earning his own living in New Mllford. I think he was working for Mr. Wanzer Marsh who was a well-to-do man that always proved a good friend to my father and mother. Grandfather Eli prospered in Vermont and his farm with the original house is now owned by a great grandson, Mr. George H. Soule of Fairfield and St. Albans. 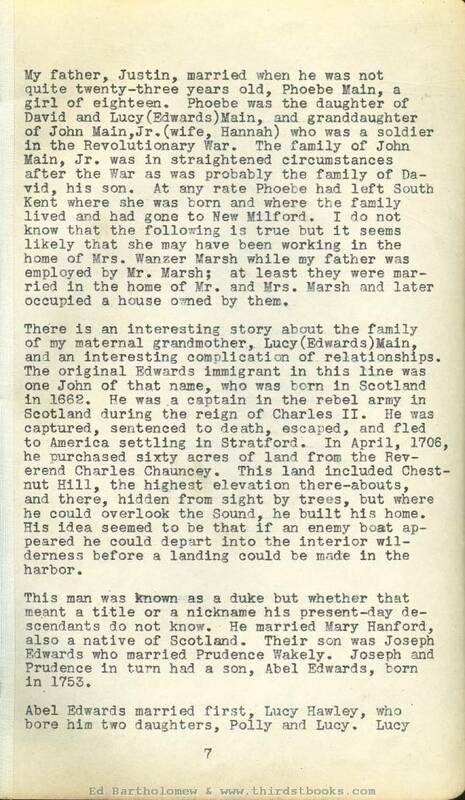 There is an interesting story about the family of my maternal grandmother, Lucy (Edwards) Main, and an interesting complication of relationships. The original Edwards immigrant in this line was one John of that name, who was born in Scotland in 1662. He was .a captain in the rebel army in Scotland during the reign of Charles II. He was captured, sentenced to death, escaped, and fled to America settling in Stratford. In April, 1706, he purchased sixty acres of land from the Reverend Charles Chauncey. This land included Chestnut Hill, the highest elevation there-abouts, and there, hidden from sight by trees, but where he could overlook the Sound, he built his home. His idea seemed to be that if an enemy boat appeared he could depart into the interior wilderness before a landing could be made in the harbor. This man was known as a duke but whether that meant a title or a nickname his present-day descendants do not know. He married Mary Hanford, also a native of Scotland. Their son was Joseph Edwards who married Prudence Wakely. Joseph and Prudence in turn had a son, Abel Edwards, born in 1753.
married David Main and became my maternal grandmother. Polly married a man named Sigsby and her family moved to New York State. Lucy (Hawley) Edwards died and Abel married again, a girl named Sarah Mann. Among their children was a daughter. Charity Edwards, who married Joseph Ebenezer Bostwick. Charity and Joseph Ebenezer had a son, Isaac Brook Bostwick, who married my oldest sister, Lavinia Ann Sherman, thus involving a tangle of relationships that I have tried in vain to straighten out, Abel Edwards was a private in the Revolutionary War and was wounded at the battle of Bemis Heights or Stillwater, commonly known as the battle of Saratoga that ended in the surrender of Burgoyne, October 7, 1777. My sister Lavinia’s husband, Isaac Brock Bostwick, who was born in 1814, remembered Abel Edwards very well and has described to me many times the slanting scar on Abel's upper lip that resulted from a saber cut. He said this wound was received September 16 or 17, 1777. My great uncle Jotham Sherman, born in 1768, also knew Abel well and told the same story. How after a long trip into early family history I return to my opening sentence and repeat that I was born the eighth of October, 1824, and my memory of consecutive events dates from the spring of 1827 or 28, when my family moved into another house owned by their good friend Wanzer Marsh; the place was known as the "saw-mill house" and I remember that the day we moved Grandmother Main came to help us. It is the only time I ever saw her; she died soon afterward. I speak of her as Grandmother Main but at that time Grandfather Main was dead and she had married again, a man named Emmons, and was living in Cornwall, Connecticut. She died April 28, 1828, and is buried in Cornwall. from northern Vermont to southwestern Connecticut; I have often wondered how many days it took. We lived in Saw-mill house until the spring of 1831. I think of my early schooling as being meagre and scattered but I remember that I had begun to go to school before we moved to Peet Hill that fall. That same fall Grandmother Sherman and Uncle Marshall came to visit us. Grandmother was sixty-one years old at that time and she must always have been a strong woman as she seemed to think nothing of the hardships of the journey and she lived into her eighty-ninth year. I lived in his family two years, until he migrated to Ohio. After that I lived in the home of Sheldon Platt for another two years. During these four years I attended school parts of each winter as I could but the work was interrupted and I was behind for my age; I was now eleven-and-a-half and had attended school not more than two years altogether. In the spring of 1836 I went to live in the home of Abel Gunn and stayed there four years. The family was motherless and consisted of the father and three grown children - two sons and a daughter - all of whom were married during my stay in the household. The influences in the home were not the best and I did not take advantage of even the meagre opportunity I was offered to attend school. -lihood (liveihood) . Abel Gunn's sons were married and working for themselves and Abel was glad to have me go back to him and work for my board nights and mornings while attending school during the day. The school was at Northville and I studied hard that winter but labored under great disadvantage because of not being rightly directed and trying to go on with classes beyond my acquirements. I struggled with ancient history when I should have been delving in the spelling book, I was ashamed that I was behind other pupils of my age and thought I must pursue the same subjects they did even though unprepared for the work. The spring and summer of 1841 I worked for Cyrus Morehouse in his marble quarry but was never able to collect all my wages and went back to Abel Gunn's in the fall expecting to work under the same conditions as before, but the seventeenth of December my father died and I was obliged to go home. The winter of 1841 and 48 was unusually severe. There was a family living across the river from us who were in extreme poverty, and my father, poor as he himself was, tried to help them. On the seventeenth of December he gathered such food and clothing as he could from all the neighbors and took the load on a sled across the river on the ice. On the way back horses, sled, and all broke through the ice and my father was drowned. Mother was left with three little girls, six, four, and one-and-a half years old. My older brother, Ell, was working away from home and brother Hawley was only thirteen so I was the one to stay with Mother and do the farm work. However during the winter when there was not so much to do I was able to attend Mrs. Mary Ann Stone's school and under her teaching came to realize that if I were ever to get anywhere in life I must somehow have schooling.